Stunning period home with park like grounds. 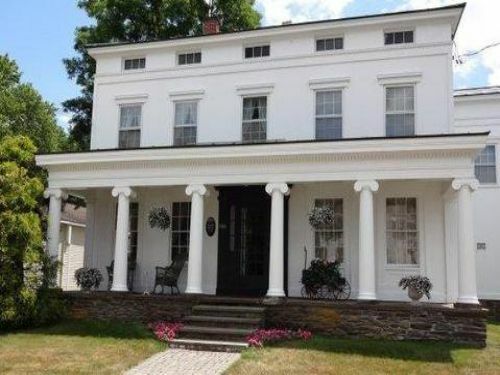 This magnificent 7 bedroom home could be a treasured home for your large family or return to a B&B serving Cooperstown and Oneonta (Glimmerglass Opera, Dreams Park, Otsego Lake. All Star Village etc - check it out at Lovingly restored with character, the home features gracious living, dining and family rooms, office, kitchen with butler's pantry and built-in ice box, 7 bedrooms, 4 working fireplaces plus a very usable 3rd floor with several more rooms featuring lovely stenciled floors. Enjoy evenings on the front porch or rear deck overlooking manicured lawns and gardens or sitting on the porch of the garden house basking in the glow of the gas lamps. Basement workshop. Extra large carriage barn fits your cars and toys. Everything is in tip top condition and this home must be seen. Terrific value for a large home with Village charm and Cooperstown schools yet only a short drive to Oneonta too.